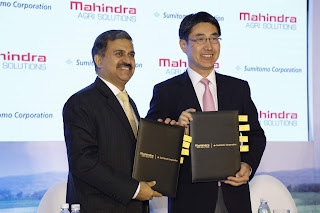 Mumbai, October 12, 2018: Mahindra Agri Solutions Ltd. (MASL), a subsidiary of Mahindra & Mahindra, part of the USD 20.7 billion Mahindra Group, today entered into a joint venture agreement with Sumitomo Corporation Group, Japan, a global player in multiple industries including crop care, having access to the latest crop protection technologies. The joint venture will have Mahindra and Sumitomo Corporation holding 60% and 40% equity respectively in the new company named Mahindra Summit Agriscience Limited, subject to the parties receiving all applicable approvals. The combined strength of both the shareholders will leapfrog MASL’s crop care business into the next orbit of growth. 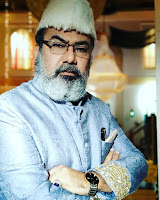 The partnership will offer a pipeline of specialty, new generation products with unique and latest molecules to effectively manage pest and insect related challenges faced by farmers. The joint venture will benefit from the expertise of both the companies - Mahindra’s strong rural presence and Sumitomo’s unique know-how and Japanese technology. Mahindra will contribute through its strong farmer connect, wide spread domestic distribution and agriculture expertise, while Sumitomo Corporation has strong ties with large Japanese crop protection innovator companies which will result in the JV having access to latest global technology for minimising crop damage and increasing the yield. MASL would be the first Indian company to have a JV partner that has deep relationships with large Japanese R&D houses. This will definitely open up access to latest Japanese technologies and products for the Indian farmers. Initiated in 2005, MASL’s Crop Care product portfolio comprises Insecticides, Fungicides, Herbicide, Biological products and water-soluble fertilizers. Sumitomo was started in early 17th century with initial business of copper mining. Since 1992, Sumitomo Corporation had started investing in the crop care distribution channel and currently has presence in 33 countries. Today, India loses nearly 40% of its total production in terms of value to pest attacks and diseases. Since per capita land availability in India will only go down, farmers will have to raise their agriculture production by improving productivity. Hence crop protection products are an important input for facilitating pre & post-harvest management. The current estimated consumption of crop protection products in terms of value is around 2.5 billion USD and is expected to grow at 7% annually for the next few years. With such a huge market potential and few organized players in this space, this JV has significant potential to revolutionise the crop protection business in India.